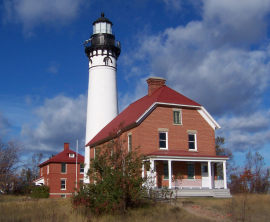 Located along Pictured Rocks National Lakeshore, this light stands on Au Sable Point on the south shore of Lake Superior, approximately 12 miles west of Grand Marais. This light tower's base diameter is 16 feet with a height of 87 feet. The lens focal plane is 107 feet above lake level. The orignial two-story keepers dwelling was attached to the light tower in the back. In 1909, the building was added on to the front so it would accommodate two families. Tours are scheduled Wednesday through Sunday beginning June 3 through September 6. No tours run on Mondays and Tuesdays. The tour lasts about 30-40 minutes and are guided by a Park Ranger.